Our adventure this weekend was planned around two things: the alpine coaster in Andorra and a tour of the Jean-Luc Lagardère plant where the Airbus A380 is assembled. In an ideal world we'd have flown directly to Toulouse-Blagnac Airport, adjacent to the production line, but mid-afternoon flight times made what we wanted to do completely impossible. As such we flew instead to Carcassonne Airport, which I'll charitably describe as a shed with an attached runway roughly ninety kilometres away. Readers unfamiliar with some of the smaller destinations that Ryanair uses will be bemused to hear about an airport that doesn't have a baggage belt; instead, it has a few shelves where luggage is placed by the handling team. The entire arrivals building is scarcely bigger than a typical living room, and given that those waiting for people are asked to remain outside. The Airbus tour was anticlimactic, especially in comparison to what can be experienced at the Boeing facilities in Seattle. It was broken into three portions; the first was a thirty minute video (which can be seen online) showing the first test flight of the A380 with guided commentary; the second was thirty minutes on a belvedere within the plant where we could see a few planes under construction (albeit with no activity whatsoever; our guide said that "I know we're French but it's not a strike; on weekdays it would look the same as all the work is going on inside"); the third was a fifteen minute look at the inside of an A400M, which wasn't terribly exciting. Our time would probably have been better spent at the Aeroscopia museum next door, which had quite a range of aircraft including a retired Concorde; those considering a trip of their own should bear this in mind. We had a few hours to kill in the morning before our Airbus tour, and Animaparc was the only amusement park in the vicinity. 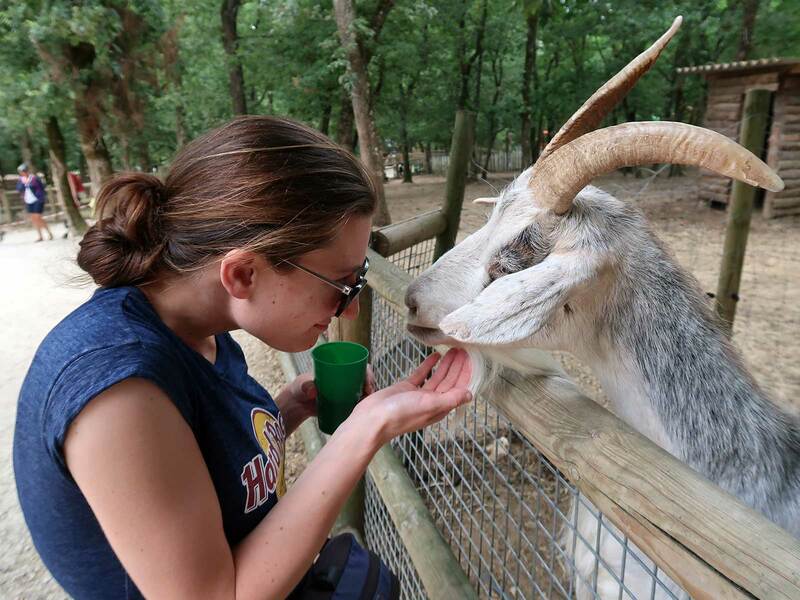 We arrived with a little over an hour to explore, which would be more than ample for most enthusiasts, though anyone who travels with an animal lover should budget longer; we ended up having to rush through the amusement rides after Megan spent forty-five minutes in the petting zoo. In the end our only ride was a three lap cycle on Petit Huit, a family coaster I'd ridden before in in its previous home; with that done we had time for a quick power walk around the rest of the park before heading to the exit.